The garden snake or garter snake belongs to the most widely distributed genus of reptile in the continent of North America: Thamnopis. It can live in a wide variety of habitats and climates. It is one of the few varieties of snakes that inhabit Alaska and also has been found in Nicaragua. Though the appearance of garter snakes does vary, they are generally 2 to 3 feet in length, with stripes against an either plain or checkered background of green or brown. Garter snakes, like all snakes, are carnivorous. They can be found in a wide array of habitats and their diet is largely dependent upon the type of environment they live in. They are adaptive creatures and can eat whatever happens to be available. They have been known to eat eggs, but usually eat live animals. They tend to hunt most frequently in warm temperatures in the early morning, mid-afternoon and late evening. All their food is swallowed whole. Garter snakes can eat any creature they can overpower such as slugs, snails, earthworms and lizards, birds and rodents, especially mice. They are not known to eat dogs or cats because they are too large for them to overcome. However, if you keep small rodents in small outdoor cages, protect them against garter snakes. Near water, a garter snake's diet changes. They are able to feed on leeches, tadpoles and fish. They are also able to eat frogs, salamanders and toads. A toad's skin has a toxic secretion that repels many predators, but the garter snake is immune to this toxic secretion..
Garden snakes in captivity can eat the same as they do in the wild, but that may have legal ramifications for you as the owner, because you cannot kill just any wildlife. Earthworms can be harvested, but ensure you are not collecting from areas that have been sprayed with pesticides and herbicides. 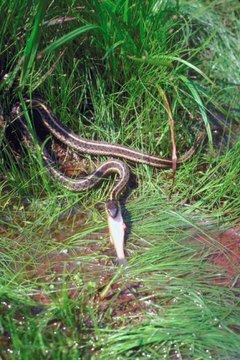 The best thing to feed a garter snake is fish -- whole as opposed to filleted, and fresh as opposed to frozen. To balance their diet, it is best to supplement their diet with leeches if the snake was found near water, or slugs if the garter was found away from water areas. Benjamin Montero has been writing since 2000, covering the arts for local publications based in Oxfordshire, U.K. and contributing to numerous political websites. He holds a Bachelor of Science in psychology and linguistics from Oxford Brookes University, as well as a Master of Arts in creative and professional writing from Brunel University in London.